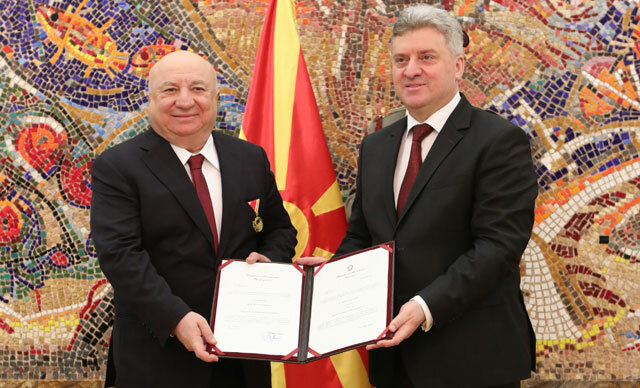 Turkish businessmen visited North Macedonia last week and met with president Gjorge Ivanov. The country’s president honored the president of the Turkish company TAV, Sadi Sener, with a medal of the state. This particular company is the constructor and investor of the two airports in Northern Macedonia. Ivanov said that in fact “Mustafa Kemal (founder of the Republic of Turkey) is Macedonian. Because at the time when he was born, Thessaloniki was Macedonian territory”. Thessaloniki was liberated by the Greek army in 1913. The president of North Macedonia said that “the Turkish Republic is a big country, it has a great economy. It is very important that such a country be friendly to us and help us. We hope this help and this support will continue in the future. We sent you the Macedonian Mustafa Kemal. Now Turkish companies come to Macedonia. This gives us great joy”. Turkey’s total investments in North Macedonia exceed USD 1.2 billion. The Turkish bank HALKBANK has 40 branches and is the third largest bank in the country.